As shown in the schematic diagram, public spaces were used to create connections between the destinations on the Yonkers waterfront. PPS worked with the developer, Homes for America Holdings, Inc., and Perkins Eastman Architects on a public space master plan for a mixed-use development on the Hudson River waterfront in Yonkers called Point Street Landing. PPS engaged key stakeholders and the larger community in discussions about creating great public destinations on the waterfront. We conducted placemaking workshops for the general public and interviewed more than thirty stakeholders from city agencies, nonprofit organizations, and local schools to determine how the waterfront development and accompanying public spaces could help serve their needs and attract the local community to the waterfront. 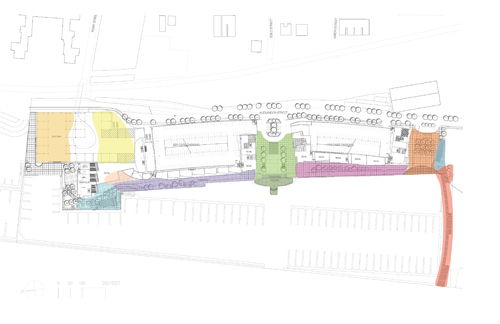 PPS developed the public space program and assisted the project architects, Perkins Eastman, in the waterfront design. Yonkers is a city of 200,000 immediately north of New York City, where Homes For America Holdings Inc. has planned a $900 million mixed-use development on a 14.5-acre site. Plans include 1,124 housing units in townhouses and four high-rise buildings, with retail and restaurants on the ground floor, as well as a marina, a public pier, and four acres of public spaces that will include an esplanade, a community recreation area and plazas for community gatherings. Ideas that emerged from the community process included: small-scale boat storage and access for community boating programs; outdoor performance and movie venues; food and dining opportunities that are reasonably priced for local residents; and opportunities for outdoor environmental education. PPS also worked closely with the architects to ensure public access to the entire riverfront, rather than waterfront residents claiming exclusive use. The Power of 10+ principle—in which good public places contain at least 10 distinct destinations—was incorporated into the Yonkers plan to create an exciting variety of public destinations with broad public appeal. 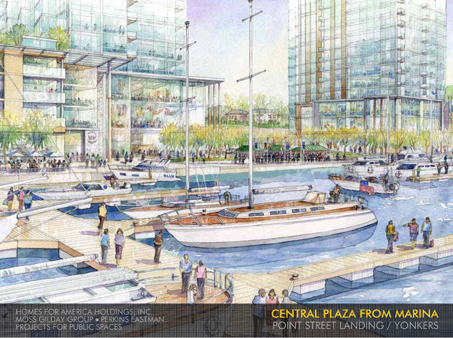 Rendering of active marina by Perkins Eastman Architects.